This example for a Yún device shows how to use the Bridge library's Process class to run Linux processes on the AR9331. Specifically, in this example, you'll be using curl and cat to transfer data from a web server and get information on the Linux processor. In setup(), you'll want to initialize Bridge and start a serial connection. Before running the rest of setup() wait for a serial connection to become active. The rest of setup() is used to call your two custom functions, runCurl() and runCpuInfo(). There's nothing in loop(). 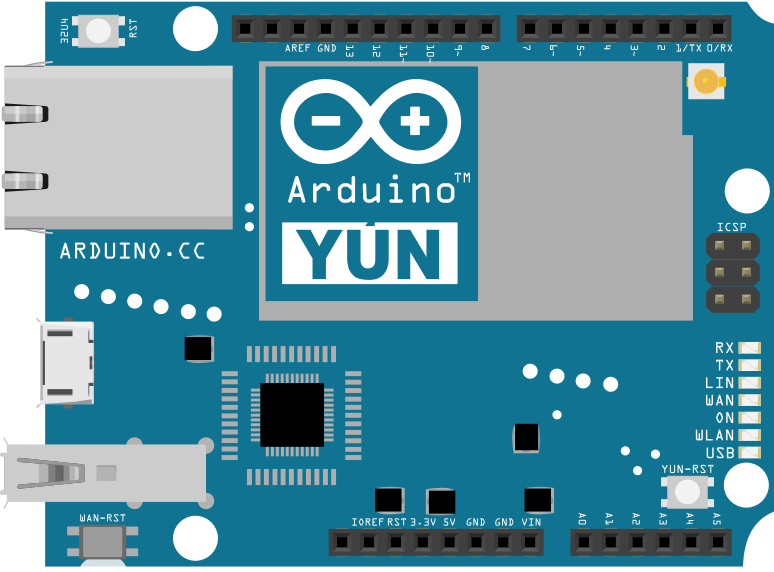 runCurl() will launch the curl command and download the Arduino logo as ASCII. Create a named Process and start it by calling myProcess.begin("curl");. Add the URL to retrieve with the addParameter() method, and run it all with run(). For the runCpuInfo() function, you'll create a new process for cat. Add the parameter to cat passing it the path to the cpu Info file, then run the process. p.addParameter("http://www.arduino.cc/asciilogo.txt"); // Add the URL parameter to "curl"